The Columbus Holiday weekend of 2012 found many young hunters in the woods trying to get, maybe, their first deer hunting experience. 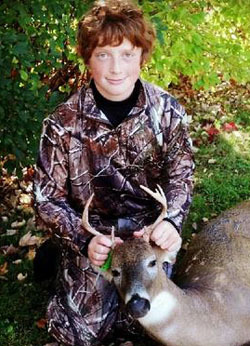 This year's 2012 Youth Hunt in New York also found some success for many of those hunters. 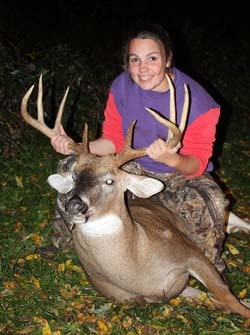 Here are some of those successful deer hunting stories and photos. 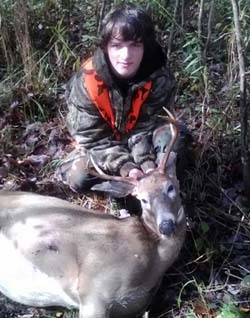 If you know of a successful hunter from this year's youth hunt please send us a story and/or photo to nyantler@twcny.rr.com and we will feature it on this page. Just tell your story the way you'd tell your friends. Make sure you add any information you know like, weight, weapon type, number of points, etc We'll take care of the puncuation and spelling. 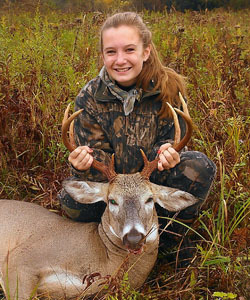 Be sure to send a quality photo of you and your deer along with your full name, age and County of kill. 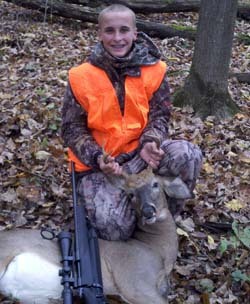 Jacob Weis, age 13, shot with a bow in Pavilion, NY Genesee County, 8-point, 1st deer ever, 10/18/2012. 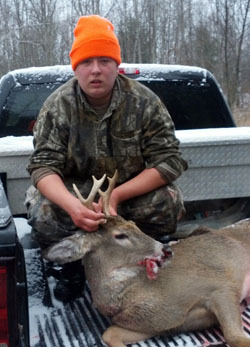 Shawn Halstead, 15, with his first buck a 6 point taken in Livingston County. 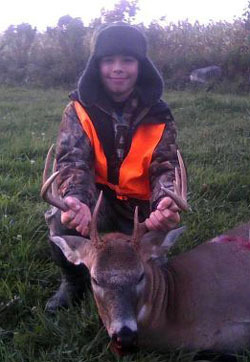 Thalon Paul, shot his first deer a 6-point during the Columbus weekend youth hunt in the Town of Eaton. 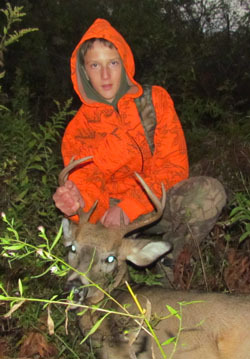 Logan Walters, 15 years old, Oneida County, first deer. 6 point! 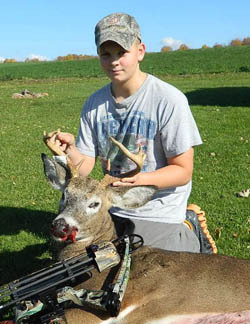 9th Grader, Aidan Schwarz, 14, of Cicero, NY shot this Tioga County 6-point with his dad's HOWA .270. 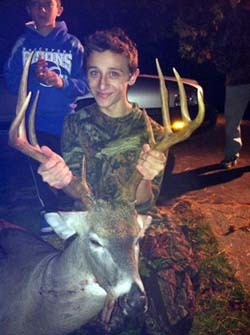 His buck field dressed at 116 lbs . 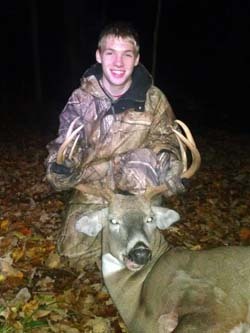 Cole Dailey of Gowanda, NY shot this 8-pointt with an 18" inside spread that dressed out at a massive 192 lbs on Columbus Day while hunting with his uncles in Cattaraugus. 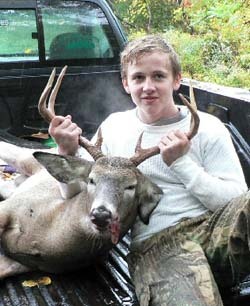 Frankie Cowan, Age 14, from Jordanville, NY shot this beautiful buck on 10/7/12 while hunting with his stepfather, Jeffrey Sarafin, from 40 yards away with his Remington 30-06. 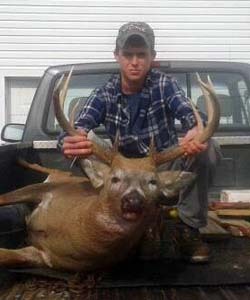 This buck had 10 points, a 19.5 inch spread and dressed out at 215 lbs. 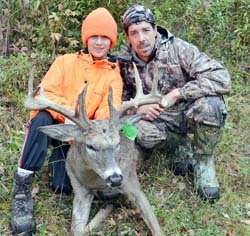 Garrett Gaydosh of Galen, NY arrowed this 8-point with his Matthews Outback bow. 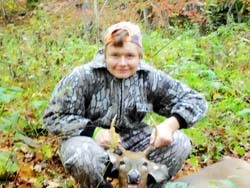 This is Garrett's first year bowhunting. 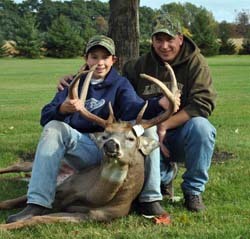 Dylan Main, 14, of Nunda, NY with his father David after shooting his 11-pointer that weighed 201 pounds field dressed, and a rough score of 148. Before shooting the deer the two had an incident with a bear that charged them to within 7 yards before Dave jumped up and scared the bear away. 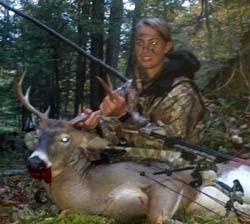 Rhiannon’s first deer was taken on Saturday of the youth deer hunt. 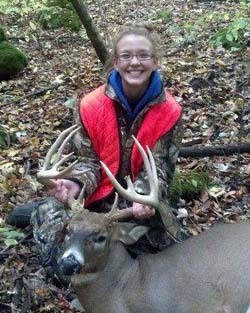 Her and her Dad were just starting to get down from their stand when this brute showed up ,she quickly moved her Rem.11-87 20 gauge on target and squeezed one off. Immediately the buck mule kicked and after waiting 20 minutes we found him no more than 10 yards from where the shot hit him. 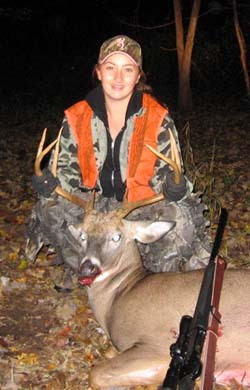 this was not only her first deer, but her first deer hunt.